Program-World's Championship Pack Burro Race-Colorado 1962 Price:$8.00+$5.00 S&H This is a program for the 14th annual world championship pack burro race. 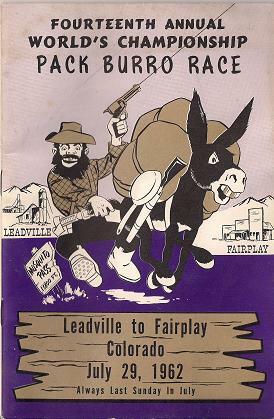 It was run from Leadville to Fairplay, Colorado on July 29, 1962. It measures 8 1/4 inches by 5 1/2 inches and contains 24 pages.It is in excellent condition.